I'm not asking Hamilton City Council to lead the way or do anything ground-breaking. I simply ask that we learn from other cities that have already led the way and have done things that work. I would like to address a few points surrounding the recent one-way/two-way discussion that I fear are being lost in the shuffle. First, I live in the lower city near King and Locke Streets, and work near Gage Park on Main Street East. I drive there (my kids go to school there too) most days and my trip is almost entirely on one-way streets. When my wife and I moved downtown 11 years ago we immediately noticed one thing that was a huge drag on the quality of life and vibrancy of downtown Hamilton - the one-way freeways. Not halfway houses, bingo halls, cheque cashing stores or pawn shops. Urban freeways. Having lived here for 11 years now I can very clearly state that this is STILL the number 1 safety concern on our minds on a daily basis as we intentionally choose to raise children in the downtown core - something that I would hope city hall wants to see more of. 1. I am not aware of any residents or business owners anywhere in the city who have asked for more one-way streets. There's a reason for that. 2. We all know that our system was designed to get the mass amount of workers to the industrial north end back in its heyday. Those days are gone. The areas of the city that are the largest automobile destination these days would appear to be the shopping areas along Upper James, the Meadowlands and so on. 3. It's easy to stir up rhetoric and controversy, but I expect my elected officials to look at facts and learn the best practices from cities all over the world. One common statement made is the assumption that converting streets to two-way (or, more importantly, creating 'complete streets' which I'll get to in a minute) will slow down travel times. Yet we converted York/Wilson to two-way over a year ago and five eastbound lanes became two. I drive this route everyday to work/school and there is not a single minute added to my trip. We eliminated 3 full eastbound lanes and didn't replace them anywhere else, and traffic has been fine. King Street had two lanes closed for over a year in the area of Queen and Ray, again with no traffic slowdowns. King and Main over the 403 were cut in half for over a year with no traffic slowdowns. Cannon Street is four lanes, one-way west of Sherman, yet only one lane each direction east of Sherman...yet, no traffic slowdowns. People talk about how easy it is to drive to Eastgate Square with the one-way streets, yet more than half that trip is on two-way Main Street east of the Delta and I've never heard a request to convert it to one-way. You get the point - we have way too many traffic lanes downtown. Please study real-life information instead of believing assumptions. 4. Complete streets must become a priority at City Hall. Livable cities, best place to raise a child, vibrant business districts - all are hindered and even made impossible by roaring, high-speed car traffic. Occasionally this may involve retaining a one-way street, but with a commitment from city hall to make it a safe, viable one-way street. 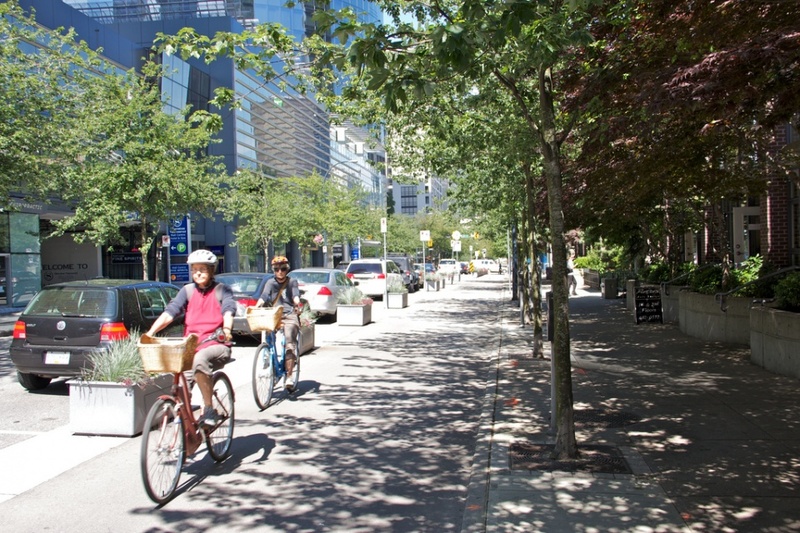 For example, this is a previously three-lane street in Vancouver. 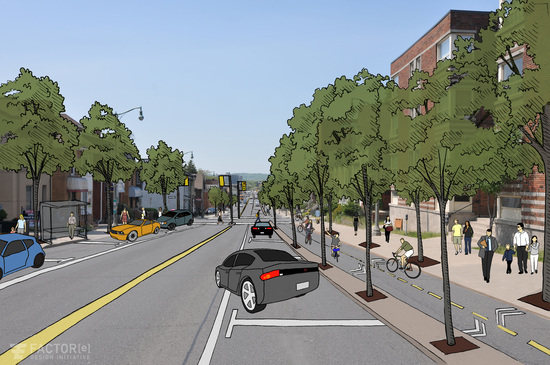 Please note, complete streets include the following: room for cars and bikes, safe sidewalks and lots of greenery in the form of curb trees and median planter boxes as shown here. This is the new way for cities to build bike lanes. Hamilton never got around to building Bike Lanes 1.0 when other cities started a couple of decades years ago, but now we have an opportunity to go from dangerous, unliveable streets to the very best practices from cities with a great quality of life. Vancouver, Portland and Montreal all receive great quality of life rankings and have booming downtowns. Leadership has brought them there. 5. Code Red. We all know about it. We all say we want to do something about it. Complete streets are one of MANY necessary changes that need to happen in these neighbourhoods in order to see them slowly become mixed-income neighbourhoods. The school board has spoken about the need for mixed incomes in these areas and we all know the 20-year life expectancy gap that exists between this area and the wealthy parts of the city. Hamilton is a caring city. I am convinced that if City Council presented a plan to the public that included complete, green streets as a way of improving the quality of life in these poor neighbourhoods, the richer suburban folks would get on board. I'm not too pretentious or selfish enough to think that a possible extra three to five minutes in my nice warm car each morning is more important than seeing a dramatic increase in the safety and quality of life for those who depend on walking/cycling our streets as their only mode of transport. I walk and bike quite a bit, but fact is, I can jump in my car when it's wet, cold, hot or I'm simply too tired. Many in Code Red don't have that option. Children have to walk these dangerous freeways to get to school, the rec centre, park and corner store. How do we ever expect to see mixed income neighbourhoods take root when you and I both know that nobody from your neighbourhoods would move into Code Red unless they had to. I've seen my own neighbourhood - Strathcona - develop into a healthy, mixed income neighbourhood, and now I've seen friends intentionally turn down other parts of the city and CHOOSE to buy homes here. Ten years ago we bought a home here because it was all we could afford. Mixed neighbourhoods are fantastic, and can work. Close to half of the residents in my neighbourhood and many Code Red areas don't own a car. In other words, they have no choice but to walk or attempt to cycle on these dangerous streets. Most Ancaster residents I know would be delighted to know that calming Hamilton's inner city streets is part of a larger plan to revitalize the area and help ease the poverty burden. But it requires leadership to happen. Two stories in Saturday's Spectator highlight the need for change in central/downtown Hamilton. One was about the need for integration and better mixing in Hamilton's schools. The other was about the Normanhurst rec centre - and specifically, I was touched by hearing of the Ancaster couple who volunteer there in order to help the local kids. Don't tell me that couple will oppose two-way or complete streets because they think a few minutes of their driving time is more important than a safe neighbourhood for those kids. Only the ultra-selfish among us would believe that. Complete streets would do wonders for the quality of life in our Code Red areas. We either want to be the best place to raise a child or we don't. Vancouver has 7,000 kids living downtown. I'm not asking Hamilton City Council to lead the way or do anything ground-breaking. I simply ask that we learn from other cities that have already led the way and have done things that work. There is enough sidewalk width on Cannon and Main to plant trees all along the curb without impacting pedestrian space, add curb parking on one-side, two-way bike paths on the other and suddenly we have turned dangerous, unliveable highways into complete, safe streets that still allow for easy car movement while protecting pedestrians and cyclists. Suburban commuters still retain the vast majority of the road space for coming downtown, yet poorer residents who don't drive are also afforded an opportunity to safely move around our city by foot or bike. I would also suggest we look at streets that are absolutely over capacity, yet retain some great residential character such as Victoria/Wellington/Wentworth and Sanford. The city has done some good work recently with the new Beasley rec centre and park. The school board has built new schools at Beasley along with Queen Victoria, Sanford and Prince of Wales. Cathedral exists between King and Wilson and Hess Street is on York. One new high school is planned right smack in the middle. Let's give these neighbourhoods a fighting chance. With amenities like these, I believe mixed income integration can happen, but only if parents feel that their kids can safely go to the park or walk to school. I hope that Hamilton is prepared to take action to address the low quality of life in our Code Red district. The status quo simply can't be accepted any longer. FYI, this was sent to all of city council. ...shame they wont read it! parse error, too many negations. I don't not not not disagree with this statement. Seriously, those depict streets that are 3-4 lanes tops being converted in to 2+bidirectional bike lanes. Main is 5. You could do 3 + bidirectional bike lane + wider sidewalks on the left side on Main. 3 lanes of parallel traffic with synchronized lights is still lots. It's what Main has outside of rush-hour when the street-side parking is allowed. That's hardly crippling. What about the light rail transit they were talking about for Main st? I know this and you know this but it's clear that the council (which shows no signs of being retired) clearly can't see it. But we could have a beautiful street for everyone that is still one way. And coupled with changing ALL of the n/s streets, it would be quite a livable solution. I hear you Sean but as soon as you suggest bike lanes, bumpouts, sidewalks or parking you will get the exact same reaction by the exact same people as you get with two way. Any form of traffic calming is heresy to these people. In that case, if we're going to encounter resistance anyway, we might as well push to get the best possible complete streets - including two-way traffic, which actually makes the streets more usable for motorists. The real objection to two-way conversion is not one-way/two-way per se, but the perception that driving times will increase if through capacity is reduced. Giving up on two-way conversion and aiming for one-way with bike lanes and so on will do nothing to make complete streets more palatable to people who currently see downtown streets as a way to get somewhere else as fast as possible. Right, but there is an inherent perception that two-way conversions will create absolute gridlock (even though it's not true, that doesn't mean people don't think it). "Streetscaping" proposals may not bring out the knee jerk reactionaries thereby allowing us to slip a livable street under their radar :-). It's almost as if the phrase "Two way" is a poison pill with some of the "non negotiable" streets. I personally don't think we need any one way streets at all, but many obviously think we do. Sadly, it looks like we will never see an overnight reversion akin to the one that got us into this mess in the 1950s, but we can still create huge changes with smaller well managed steps toward a well designed final goal. The proposal could start with streets that are identified as in need of resurfacing, and have the conversion set to trigger when the resurfacing project is budgeted for. Why not grab the low hanging fruit - I'm tired of the top-of-the-tree apples. I'm not getting any younger! I've seen the same reactions of "the majority must rule!" and whatnot when suggesting that a lane could be converted away from live traffic to get the cars away from pedestrians while maintaining the highway speeds on main. People bombing across downtown consider the lanes of King and Main to be sacrosanct. The only low-hanging-fruit we could probably get away without drawing that ire would be converting all the non-truck-routes... the Herkimers and the Hunters and Wilsons of the city. Which, I gotta say, I'm kinda disappointed that McHattie and Farr couldn't get from council. Let's not give it up before the struggle even begins. I'm with both of you guys. Certainly don't want this piece to be seen as 'giving up', but rather keeping the focus on liveable streets, even if it means a few one-ways are retained. Montreal just installed their first 2-way bike path on a two-way street and the reviews from cyclists have been critical. As one cycling advocacy group said "these 2-way bike paths work better on one-way streets because they allow for ample space for 2 good bike lanes". Apparently the new lanes put on a 2-way street are much narrower than the one's on 1-ways due to the difficulty of removing entire lanes on a two-way street. Turn lanes complicate things a bit, but they're just a challenge, not a barrier. Main West west of Longwood manages decently well. All you have to do is push the edge of the curbside parking back from the intersection. As I say, not impossible. I'm sure the City will figure it out. I'm guessing long term we will see a mix of one-ways and two-ways like Montreal, Vancouver etc.... Virtually all N/S streets could go two-way easily: Queen (although I might like the two-way bike path idea here), Bay, Victoria, Wellington, Wentworth, Sanford etc.... and obviously all the small, useless ones like Park, Catharine etc.... Some E/W streets could also be converted such as Herkimer west of Queen, Hunter. I could see Wilson being two-way entirely, King housing LRT and perhaps Main and Cannon with this bike-path/one-way configuration. I'm trying to make sure that complete streets aren't lost in the discussion. Turning Main from a speeding 5 lane one way to a speeding 5 lane two-way doesn't appeal much to me. And we're going to have to show the suburbs (apparently, even though it never works the other way around when they make changes to their road networks) that a renewed quality of life downtown and in Code Red will enhance our economy, assist poverty reduction, increase economic activity, and therefore make downtown and it's social costs less dependent on suburban assistance (again, a perception that exists around Hamilton). anything with three active lanes in a single direction is a highway. Look at Main Street in Westdale. The difference is that Main Steet generally sports wide sidewalks and grassy boulevards to keep traffic away from pedestrians, and most of the things along Main are plazas and the hospital and the university... not a streetwall or homes. But still, it's obviously a highway. The reverse is also true. King is 1-way with synchronized lights through the International Village, but that's not a highway. It's only two traveling lanes. And besides that, even if it was the parking bump-outs and wide sidewalks keep the traffic away from pedestrians. So yeah, if the city finds a place where they want to cut a street down to two lanes and keep it one-way? Well, that still screws up wayfinding, but at least you won't see freakishly fast traffic right next to pedestrians anymore. Otherwise? Two way. Highways should not exist in the middle of the city, especially with nothing separating them from pedestrians. To my eyes, being able to 'learn from other cities that have already led the way and have done things that work' connotes leadership and breaking ground in Hamilton. Call me an unflappable cynic, but that's what I see. Can anyone provide instances where City Council has done this? Learn from other cities and adopted their strategies? In the main, I think too many presumptions are made when it comes to expectations of our civic leaders, especially by those who are 'aware-and-energized'. We have a City tradition of only part of the formula for governance on Council's end being provided: the 'management' part, not the 'visionary leadership' part. That's not to say there aren't members capable of the latter, but voters consistently set the bar pretty low, wouldn't you say? Eisenberger toured some LRT cities in Europe didn't he? ...did he bring another councillor with him? I don't know about Europe, but when Fred Eisenberger was mayor, he went on a tour of the LRT systems in Calgary, Portland and Charlotte, accompanied by Councillor Lloyd Ferguson and Public Works and Planning & Economic Development staff. Just out of curiosity, can anyone suggest what it might cost to institute "complete streets" designs such as those described above on the 8.5km from Mac to the Delta? of the street, but does not include reconstruction of the existing roadway. That's roughly $2m in 2012CAD for a 400m conversion. If you did away with the ornamental aspects (#5-7), you could whittle cost down by $900K. I assume that greater distance might introduce some savings from economy of scale but based solely on the above the price tag would be something on the order of $21m-$42m (plus road reconstruction) if you wanted to give a similar treatment to Main from Mac to the Delta. That's arguably peanuts when you think of the undertaking and the effect it would have. The other aspect of the equation is planning and implementation. That stretch of York had a planning and implementation timeline of 25-40 months. Fast, sloppy math. If you did away with the ornamental aspects (#5-7), you could whittle cost down by $750K. Alternately, does anyone have a ballpark idea of what the City had banked for streetscaping on King/Main/Queen/Cannon? It is a fad or trend nowadays to convert one way to two, not only in Hamilton but all-cross North America. And frankly, I believe it is a waste of money which would be put to better use to making more bike lanes. You can't have it both ways Mr. Leach. I fully support more bike lanes in Hamilton, but with your “Complete streets” its near impossible to implement. I agree with you; the status quo shouldn't be accepted any longer but some of your ideas are simply unrealistic or already proven not to be successful. Barton street had its added greenery and widen sidewalks between Wentworth and Wellington some years ago; from my observation, the area hasn't improved much from it. The new schools you mention are simply replacing older school that were bulldozed. There are half a dozen schools that were closed and never made new again in the last 20 years ago; and more schools to close thanks to being half full. There has been no need to truly build new schools in Hamilton's inner city for some time. makes for a good internet comment, but stats show that Hamilton's highest income earners in Ancaster/Dundas etc.... work in downtown Hamilton. Hamilton's metro area average family income is almost $10,000/year higher than Toronto's metro area. It's a "fad" to undo what was done in during the one-way "fad" in the 50s? We aren't talking about hairdos here, we are talking about urban design based on studies, experience, observation and reality. One Way Streets started in the mid 30s and peeked in the 70s. And Urban Planning has always followed trends/fads. Look at older and new sub-divisions for your urban planning trends. I'm sure in 50 years if we still drive cars, the streets will be turned back to one-way streets as the city sprawls into sub-division oblivion; And people need to hurry to one side of the city to the other side with no care of what is in-between. Hey Jason, please stop misrepresenting where you live. The Locke/Dundurn area north of King isn't downtown. You live in the lower city, not downtown. everyone has their own definition of what constitutes "downtown"
Official consensus from the perspective of city planners and economic development staff seems to be that downtown is a broad belt across the middle of Ward 2. A loose estimate would involve four neighbourhoods: Central, Beasley, Durand and Kirkendall. City of Hamilton: "The Downtown Secondary Planning Area describes the lands bounded by Queen, Hunter, Wellington and Cannon Streets." In recent years, Hamilton EcDev has expanded that formula to include the commercial districts on James and eastward to Wentworth. Downtown Hamilton BIA: "The Downtown Hamilton Business Improvement Area (BIA) is a non-profit association, which was officially formed in 1982... The area designated as the Downtown BIA was to include MacNab Street to Mary Streets, Main Street to King William. In 2001 the BIA expanded to include Rebecca Street to the north and the south side of Main Street. In 2008 the Bia expanded southward Hunter Street from MacNab to Catharine." The one exception that I've seen placing Locke "downtown" is the parking lot map. In future, Jason can just refer to his neighbourhood as Municipal Lot 22.
lol....geez, I didn't realize living 2 blocks west of Queen was such a massive issue for some. So, I live 2 blocks from 'downtown'. Does this really matter for the issue at hand? Just clarifying that the City has a pretty clear definition of "Downtown", so when you write that "we intentionally choose to raise children in the downtown core," the suggestion is that your nearby park is Gore, Central or Beasley, not Victoria. Put down roots wherever you choose. Hopefully more and more families choose downtown. ahh, I see. the Downtown improvement zone, or whatever it's called. Yes, they list it from Queen to Wellington I think? I look at the area from the 403, harbour, escarpment and Victoria/Wentworth as 'downtown'. Regardless, point taken. Why would you do that? Meadowlands, Burlington Mall, Mapleview and Lime Ridge are all so much faster to get to. Is there some incredible store at Eastgate that makes people drive across the whole city to get there. Well, there's a pretty good Value Village just beyond Eastgate. That's pretty much the only reason I trek that far. Two-way streets not good for pedestrians As a Hamilton resident who travels all over the city on foot, by bicycle, and by car, I’ve read the articles and letters on one-way versus two-way streets with interest. The idea that two-way streets are more “pedestrian friendly” and “business friendly” is a myth. Want proof? Enjoy a stroll along Barton Street. Notice how many of the most “pedestrian friendly” areas are also the most derelict. Still not convinced? Put on your hiking shoes and explore the suburban heights of Hamilton Mountain. As you wander among the fields of homes and enjoy the scenery of mega-marts and parking lots, you’ll notice the only thing harder to find than a one-way street are pedestrians. This contrasts with the much higher level of discourse here, where at least there's been passionate investigation of the subject...even if some of it is blinkered and arbitrary. Where would you be walking to along the streets in the "suburban heights" of Hamilton mountain? Some of the foot traffic which passes by my "downtown" home (east side of Queen Street) consists of people exercise walking or jogging, but the bulk of it is people travelling to a destination (shopping, work, church, etc.). In the suburbs, the distances between homes and any of these destinations is generally considered too far to walk, much easier to hop into the car. Don't expect pedestrians in neighbourhoods designed for cars no matter how wide the sidewalks and that the streets are two-way. I suspect the lack of walkable destinations is also a factor on Barton Street as many businesses have been closed and so there are fewer places to walk to. Ummm, actually Barton is FAR more pedestrian friendly than King, Cannon, Main etc.... the industrial economy got walloped years ago and left Barton's storefronts a shell of their former self, but it's a very easy street to walk along and not feel like a massive freeway is at your elbows. Imagine how much worse Barton would be today had it been converted to a 4-lane highway back in the 50's? The way things currently stand, I expect Barton will make a 'comeback' before King, Cannon etc.... The bones are in place... as prices rise on James St, some love should start to spread east on Barton. Take a virtual drive down Queen street....the resemblance to Barton is uncanny. As downtown real estate continues to rise, the action will start to slide east where big, historic homes are cheap. Don't be surprised if in 15 years Barton is the new James...especially if King is still a freeway. Convert Wentworth and Sanford to two-way traffic with bike lanes, convert Westinghouse, Sanford Ave school and other buildings on Barton into bare-bones lofts/creative studios and suddenly the surrounding side streets, which are quite cute and tidy, become ground zero for the next wave of creative types, TO migrants and young people. One of the reasons I hope the Cannon Knitting Mills project is a success is the boost it will provide in that area. Give Cannon the 'complete streets' treatment as I've outlined in this article, and we start to lay the groundwork for re-investment in a long-neglected part of town. "Don't think that coffee roasters, espresso bars, bistros, art bars and music venues can't co-exist with money marts, drop in centres, shelters, thrift stores and boarded up buildings." James North (which even adds a pawnbroker to the mix) is living proof. Are you the same Jason who wrote the above article? Just curious.